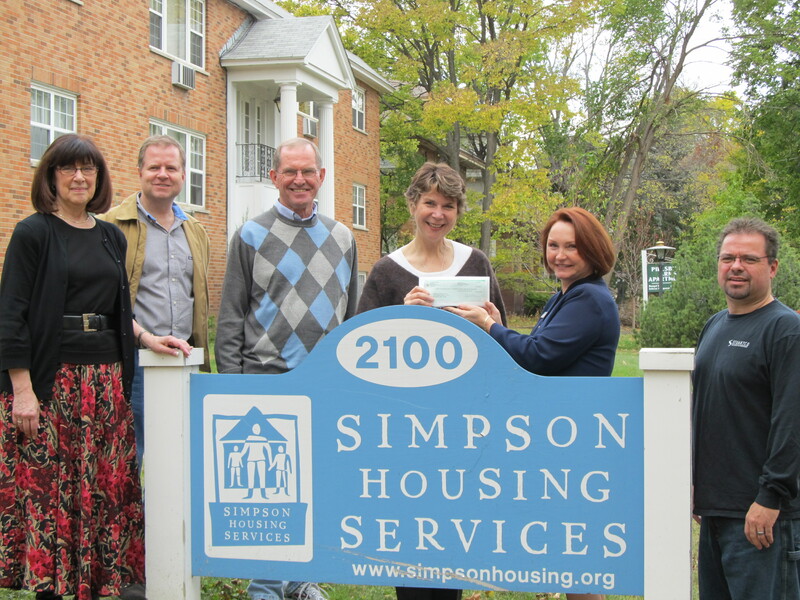 Wednesday we had the pleasure of delivering a check to Simpson Housing Services. The ‘we’ in this sentence was the team at The Plaza, collecting a total of $900.00. Wow! They did a wonderful job and were able to feel the satisfaction of delivering the check themselves. In fact, of course everyone did a great job raising money. The money was raised over the course of one week from many of our communities during our annual Fundraising Week. See this post for the activities that each property organized to raise the funds. The total donated to Simpson Housing Services was $13,812.08, they were ecstatic to receive this amount. One of the best parts of the afternoon was when a staff member said, “Do you know how much this will help us?” It was definitely great to hear. We also were able to enjoy a tour of the entire office and meet the staff, they sure are incredible. We were joyfully associated with ‘the gold van’ after we were introduced to each staff member, StuartCo donated our old van that was used for our complimentary shuttle service at many communities in the Shepard Park area of St. Paul. They said it’s definitely had some great use driving men, women, and children all across the metro. We were so delighted to hear that! We truly enjoyed meeting everyone and look forward to our partnership with Simpson Housing Services. Stay tuned for future posts on how you can get involved with Simpson Housing Services too! Pictured left to right are Robin Hall(Plaza Manager), Dan Manning(Plaza Caretaker), Bob Odman(Simpson Housing Services Board of Directors Member), Julie Manworrren(Executive Director of Simpson Housing Servies), Tess Marsh(Plaza Assistant Manager), and Mark Brixen(Plaza Caretaker).